Below is a sampe one day course for a group of (around 4-6) people. 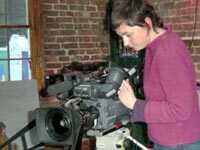 Do your staff need training on how to shoot interviews and vox pops, lighting with a pro kit or available light. Maybe they're confindent with a Z1, but need help moving up to a bigger camera like the BBC HD approved Canon XF300 and XF305,JVC HY GM650 or Sony's PMW200. PLEASE NOTE: One day is probably fine for people who already have some experience - but perhaps have never had any formal training. For beginners I highly recommend a two day course - or the three day shoot and edit course (if they need to learn editing too). Most of my courses are made up from a core of subjects such as focus, white balance, exposure and sound. Then I'll add in exercises that meet their specific needs based upon the their current abilities, the kit they will be using and the type of projects they'll be working on. I usually recommend a group of about 4-6 people. Because the larger the group, the longer it takes to do practical exercises and review them. Find out more about booking a one-to-one course or other group training sessions. If you contact me I'll put together a course that is just right for you. That said, I am often asked to explain what I can do in a day... So here are some examples below. They are just suggestions to show what can be done... your needs may differ and I can put together something different for you and your staff. Beginner's introduction to camera and audio. This first example is pretty much all about the technology. 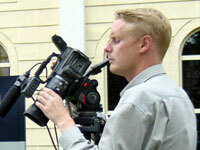 It is useful for beginners who will be shooting B Roll or taster tapes. HD, HDV, H.264, AVCHD, MXF, DVCAM and DV---16:9, 1920X1080, 1280X720, 50Mbps, 35Mbps, 24p, 25p, 50i what the numbers and letters mean and why you need to choose carefully before you start shooting. Contrast handling - or why you get silhouettes when people sit in front of bright windows. Shooting a simple one-plus-one interview. Plus a question and answer session - covering any problems they've previously experienced and need help with. "Dear Christina, Many thanks for the excellent training day last Friday. It's difficult to remember a more rewarding day in terms of learning and enjoyment, and I am really looking forward to putting all of the skills acquired into practice. No doubt I will have questions for you eventually, so let's keep in touch." "A skill expertly explained and demystified." "Thanks Christina! Wonderful training on my new Z1, easily explained, and great fun. The two day course was well organised, thorough and has helped me enormously. I would recommend you to anyone." Just wanted to say thanks for a top quality training day. Having the whole day focused on my needs was excellent (and a rare treat these days!). I thought the course was superb value for money. Everything was covered in just the right amount of detail. Instructions were clear without being in any way patronising and I must say how nice it is to be trained by a female - felt encouraging in an industry so male dominated. I would recomend your training to others as it has renewed my intrest in cameras - instead of feeling put off by all the technicalities. I now feel the freedom to be more creative and enoy it. Cheers Yvonne H.
"The one day one-on-one training course I had with Urban Fox was very useful. The course was tailor made to meet my requirements and the trainer, Christina Fox is extremely friendly and helpful. The course also has the added benefit of Christina being happy to answer any DV queries after the course ends. We covered a lot of ground in one day and I now feel a lot more confident about shooting on DV." "I really enjoyed the course - you coverered all the key areas of the camera and yet spent enough time on each. I found the practical sessions the most useful as it gave us the opportunity to apply all the theory we'd learnt. Thanks!" "The instructions were clear and easy to understand. Nothing was a problem for the trainer. She has inspired me to continue what I've learnt and go on to learn more." Excellent. very informative and interesting. At first I wondered how I was going to remember everything - but it's all falling into place. "Very good - covered all the areas I needed to learn about."